Since 2004 artist Marie Brozova had been actively fulfilling the main mission of The Defense of the Colored Pencil Project and her success shows that it's not important which media an artist uses, but what he or she creates with it. 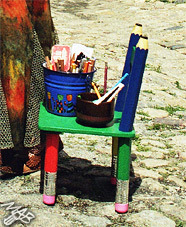 The project The Defense of Colored Pencils as an art medium was originated by the artist Marie Brozova in 2004, because she continuously met with the prejudice that colored pencils – her favorite art medium– are regarded as a mere children’s toy, unsuitable for creating an accomplished piece of art. But this prejudice is not only prevalent in artistic circles. Marie even heard from her friend, working as a teacher at an elementary school that colored pencils are strictly not allowed in art lessons from the sixth grade up, and children have to use watercolor or tempera instead. No wonder that it is not possible to see much art created with this simple and useful technique. Visitors to Marie’s exhibitions didn’t believe she used only colored pencil to create her amazing drawings, those humble colored pencils you can find in every children’s box. That was one of the reasons why she decided to start her project of drawing in public. She has been creating drawings on the biggest format of paper available (A0) in various public places before audiences passing by. She encourages all visitors to peek into her atelier and obligingly answers all questions. Marie created her project to meet halfway those people who think they don’t understand art, and who would never deliberately step into a gallery. Enthusiastic reactions of people, in her own words, gives her the energy supply required for the exhausting activities connected with the project. Special attention is given to children, who use colored pencils as their natural medium of self-expression. Let’s hope that thanks to these activities the new generations of children will accept art without prepossession, as a natural part of their lives.